Using a surfing bike rack helps you to avoids parking fees and traffic jams, is eco-friendly and is simply just more convenient if you live locally. We reviewed the best bicycle surf racks available and discovered that the Moved By Bikes provides the best overall experience. We judged this based upon ease of use, quality of materials, price and how easy the rack was to fit. Whilst the Moved By Bikes rack is number one, coming in a close second is the Carver rack which provides a similar user experience with it’s side mount design. There’s also the rear mounted surf rack from Bike Balance and the Mule rack for paddle boarders. Check out the reviews below to help you determine which bike rack to buy. There’s a number of things you need to think about before making a surfing bike rack purchase. The most popular type that gets designed with either single or double attachments points. These are easy to install onto the side of your bike and work with pretty much all bike types. Provides a better central balance, the rear mount is a great choice if you don’t like having to counter balance as you cycle (like with side mounts). The main drawback is that they don’t fit some bikes and they tend to only work with small surfboards. These are wheeled devices that are attached to the back of your bicycle. They are the best option if you have larger sized longboards or Sup paddleboards. They also work well as handheld devices also. Think about the size of your surfboard before purchasing a surfboard bike rack as bigger sized boards only work on certain types of racks. Shortboards – are the smallest boards and will work with side mounts, rear mounts and trailer mounts. Longboards – tend to only work with side mounts and trailer mounts. However, small mini-mals might be able to fit on rear mounts. Sup paddleboards – are very large and so typically only work with specialized side mounts but normally are best with trailers. Setting up a bicycle surf rack isn’t difficult, however some products provide easier and clearer instructions than others and their design is simply better. Most surf bike racks are made from aluminium or stainless steel parts. This is because you need the rack to be both lightweight and strong so that it is easy to cycle and can hold the boards. Plus the materials needs to be rust resistant in case it rains. Avoid anything that doesn’t have these properties. The typical longboard surf rack for bikes goes for $100 to $130 whereas the shortboard version is generally around $80 to $100. Rear mounts are also in the $80 to $100 range whereas trailer systems are usually $100 to $150 and sometimes much more. Clear instructions and easy to install. Solid, adaptable design that’ll fit most bicycles. Made from strong, durable materials. Keep in mind that it won’t fit paddleboard, instead try this. 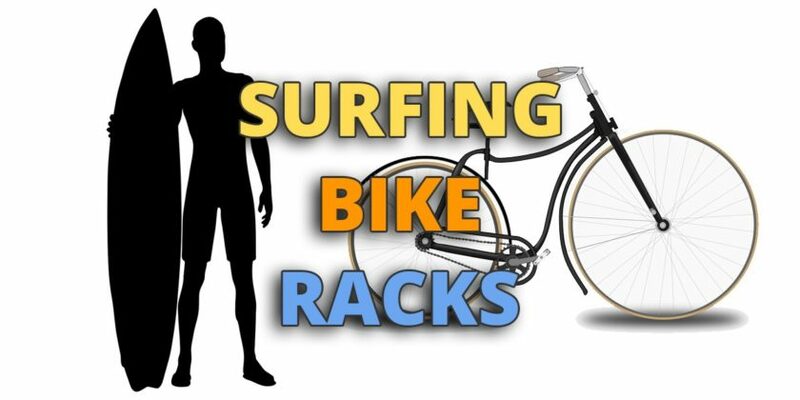 One of the best selling and highest rated bicycle surfboard racks available – and there are many good reasons. It performs in every factor you could want: easy installation, simple adjustments and quality materials. The best rated bicycle surfboard rack that we came across. As a default choice we highly recommend the longboard option over the shortboard one because it provides more space. Stable, strong design that attaches easily to your bicycle. Hardware is made from a high quality, lightweight metal alloy that doesn’t rust. Single point of installation design, instead of 2 separate points (even on the longboard version). Comes with pre-installed bungee cords. Some customers have had issues with the rack fitting certain types of bikes. Others have reported that the provided instructions are not very clear. A good runner-up, the Carver surfboard bike rack differs in that it uses a single point of installation (even for it’s longboards), has handy pre-installed bungee cords and strong quality materials. However, installation issues have caused problems for some users and so the bicycle rack loses half a point because of this. Available in both longboard and shortboard sizes. Review Of: Shortboard Bike Rack from Ho Stevie! 30 day refund if the rack doesn’t fit your surfboard or bicycle. Thick, heavy duty bars that come with bungee cords for extra security. Rotatable arms for when you’re not surfing. Only takes a few minutes to install. Only fits surfboards up to 8ft in length. Aimed mostly at shortboards, this bicycle rack looks very stylish with it’s anodized paint finish. A good side mount choice for shortboard surfers. Unique design means that you don’t have to counter-balance your weight to one side of your bicycle when riding. Lightweight design with aluminium construction that’ll still hold up in windy conditions. Can carry up to x2 shortboards at once. Works better with shortboards, though can be used with small longboards. Cannot be mounted on bicycles with existing rear racks. A unique take on the traditional surfboard rack design with this rear mount. Whilst you gain a more balanced ride, you lose in the carry capacity department. Ideal for shortboards but not so ideal for longboards. Very easy to setup and install – simplistic. Designed to carry pretty much all sized boards. Can be handheld when walking around as well. Some users have reported designs issues with the nose and tail not attaching properly. Have to be careful when turning due to the wide turning arch it creates. Designed to work with much larger longboards and paddle boards that are simply too big for traditional bicycle racks. Whilst a great design idea, whether you like this rack or not will depend upon the board and bicycle that you’re using. In addition to bicycle surf racks there’s also a few motorbike surf racks that you might want to consider. This motorbike rack attachment works by clipping to the rear cargo of your motorbike. Rust-resistant and made from aluminium, it mounts to almost all motorcycles, scooters and mopeds. Made from solid materials and looks stylish as well. Moped Surfboard Rack from Ho Stevie! Easy to install and lightweight, this surf rack works with surfboards up to 8ft in size and clips on to the rear cargo compartments of almost all types of motorbike. You might also want to consider a few accessories below for your bike surf rack. Bungee cords – one or two bungee cords will provide extra security when attaching your surfboard to your bicycle. On a tight budget and handy with tools? Then check out our guide to DIY bicycle surfboard racks. Alternatively, if you’re travelling with your surfboards over a distance then you might want to look into surfboard bags.